On any given day, brands inundate their customers with content. From Facebook to Instagram, people get an overwhelming amount of ads, imagery, and posts asking (and sometimes begging them) to take an action. And unfortunately, a significant amount of that content isn't useful or compelling. As marketers, business owners, and brands, we're overwhelming our customers. On average, a customer will see nearly 3,000 brand messages a day. The over-saturation of material is leading to severe content fatigue, and as a result, it's more challenging than ever to capture your audience's attention. It should be. Your customer deserves better content, and brands that prioritize that experience tremendous success from platform to platform. 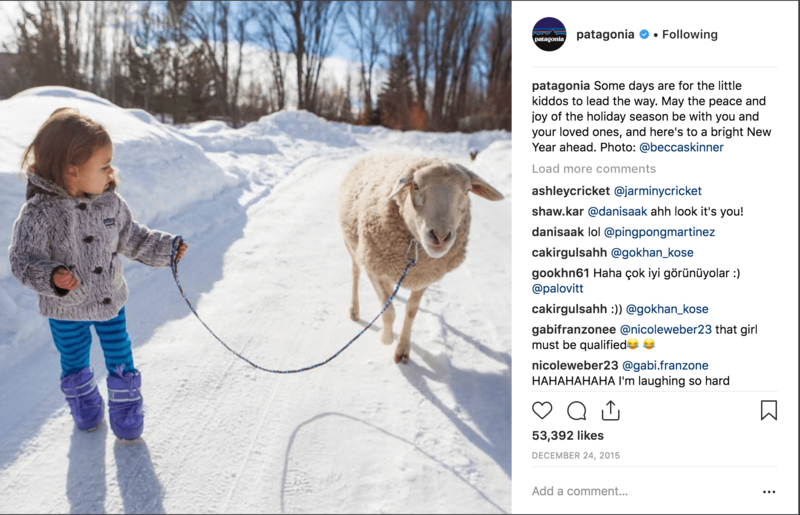 HubSpot has close to two million followers on Facebook, and Patagonia regularly gets high levels of engagement on Twitter and Instagram. RedBull and LEGO are two of the most popular brand channels on YouTube. If only you could tap into their process, right? Well, you can. In this post, I'll share how these brands are mastering content effectiveness for social media, and how you can replicate their unique approach. Nowadays, everyone has their go-to social media platforms. Twitter is a favorite for news and conversation, while Facebook is useful for keeping up with friends and brands. YouTube is where you go to learn or find entertainment. It's the understanding of each unique platform, and what your specific audience uses it for that helps top brands master social media. From there, you can choose from a few trending social media tactics to help you achieve content marketing effectiveness from your preferred platforms. When it comes to creating live content for Facebook, it can seem impossible to build something that will stand out enough for your customer to find engaging. However, Who What Wear makes it look easy. 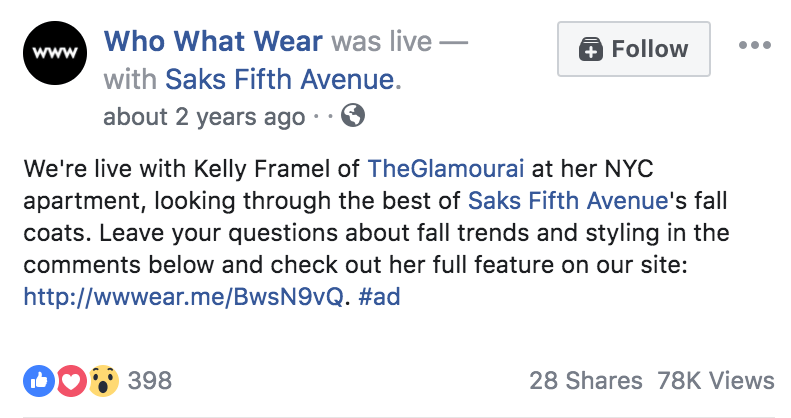 In a partnership with Saks Fifth Avenue and fashion blogger Kelly Framel, the brand posted a video showcasing their new fall coats, taking place in Kelly’s apartment. The casual, yet exciting live video was compelling because it was in a location that their target persona would find interesting while featuring an individual that they trust and admire. If you’re looking to increase customer engagement with Instagram, you can replicate this effort by partnering with a subject matter expertise within the industry. It doesn’t need to be a celebrity, just an individual that your target persona would have an interest in seeing. For ideas, check out Reddit AMAs or Quora threads and find an influencer that your audience respects or frequently discusses, quotes, or references. You can also enlist a charismatic employee or a happy customer to do a Facebook Live video that shows who they are, and how they benefit from working with you. You hear a lot about putting your unique value proposition in your website content, but you should also use it throughout your social media profiles and messaging. If you put your UVP on display, you can demonstrate your differences and establish a consistent narrative with your customer. For instance, WeWork, the chain of office and coworking spaces, use their "Make a life, not just a living,” UVP in their Instagram bio. At a glance, an Instagram visitor connect the brand with purpose and meaning. It summarizes who WeWork is and what they value. You can replicate this by using your UVP within your Instagram, YouTube, Facebook, or Twitter bio. Ryan Scott, our Head of Inbound Marketing, has a few go-to examples of exceptional UVPs including brands like Intuit, Skillshare, and more. Each UVP accomplishes the purpose of each company in the fewest words possible. If your UVP isn't descriptive as these, this is an opportunity to improve it. If you’re on Facebook, you know something about tagging. But aside from the unflattering pictures that your family posts of you from Christmas, tagging and sharing images for B2B or B2B purposes can help you engage with customers. Patagonia, the outdoor clothing and gear company, have excellent examples of this on their Instagram account. In this photo, Patagonia borrowed a photo from National Geographic photographer Becca Skinner's Instagram. Her daughter is wearing a Patagonia jacket in the picture. With a simple Google Image search, or by going through your mentions, likes, and shares, you can easily find customers posting about your products or services. This kind of content is invaluable for brands, as it showcases the value of your product and does not come off as overly promotional. And according to Forrester Research, 70 percent of U.S. adults online trust recommendations from each far more than statements from brands. You can replicate this approach by inviting your customers to share photos and feedback after they make a purchase or an investment with you. From there, you can, re-share the content and tag them. If you don't have any material to start with, use your employees and encourage your customers to participate. You can also hold a contest or offer an incentive to get customers to join in. A lot of brands use offbeat holidays to drive engagement on social media, such as National Yo-Yo Day or National Jerky Day. If you can find a holiday to match your brand, you can find relevant hashtags around that event, and use it to boost your content. 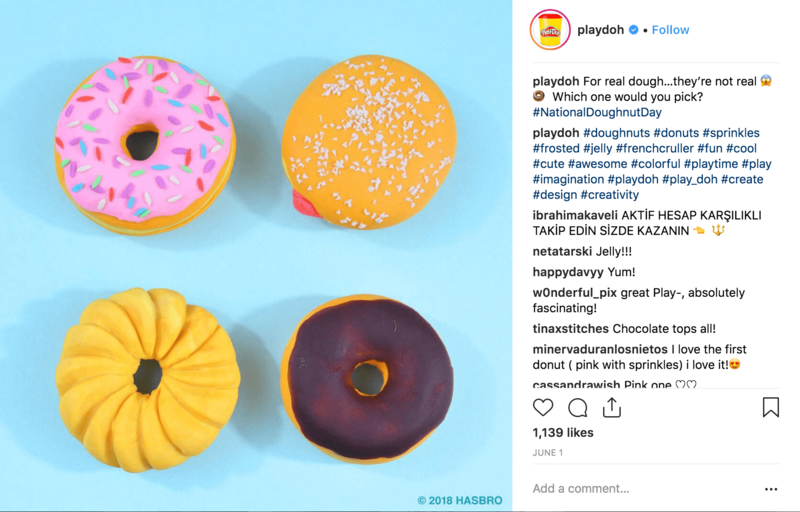 However, to stand out from the crowd, you should relate the holiday to your brand or product, as Hasbro did for Playdoh on National Doughnut Day. The brand used the holiday to show off their product and while relating it to something fun for their customers. Since #NationalDoughnutDay was trending, they got additional attention from people following the event. If you’re not savvy with trending topics and hashtags, you can use a free hashtag generator to find keywords or trending topic tools to gather more insight into your content strategy. Using illustrations on Instagram and Twitter is hot right now. 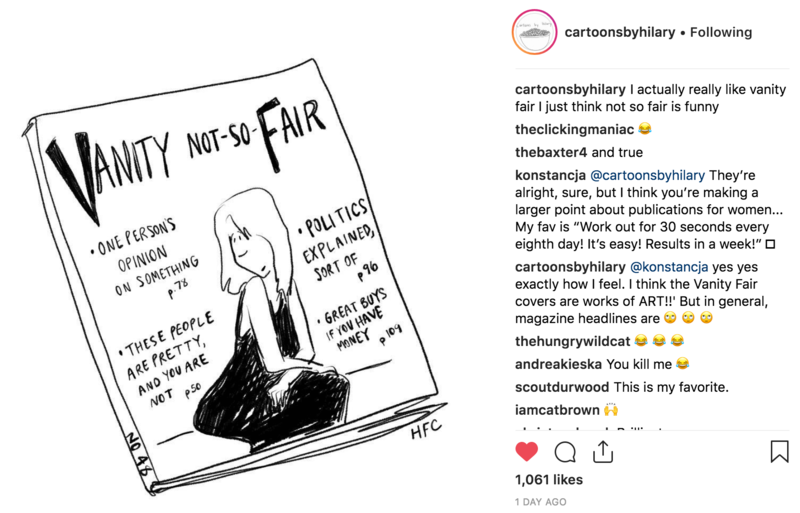 Cartoons By Hilary is an Instagram profile of an artist, Hilary Fitzgerald Campbell, that creates fun, engaging cartoons with relatable headlines. She has over 27.8k followers because her fans can commiserate with her moments of social awkwardness and inappropriate humor. If you check your buyer personas or buyer journey, you can find the frustrating, yet relatable moments of your customers. If you can align these moments and turn them into something interesting to look at, you can create highly engaging material for all of your social channels. To start, go back to your customer research. Additional strategy documents such as The Lean Canvas or a Customer Journey Map can help you generate ideas. From there, you can employ your graphic designer to turn them into quippy content, or hire an illustrator on Upwork to turn them into a cartoon or comic. For many, social media is an escape. It provides an opportunity to get out of your day-to-day circumstances, and focus on something different. If you're crafty enough, you can use this to fuel your content marketing plan for social. Cisco is a great use case. Despite being a B2B (often stereotyped for boring content), the brand makes content that taps into the viewer’s curiosity and takes them somewhere new and exciting. 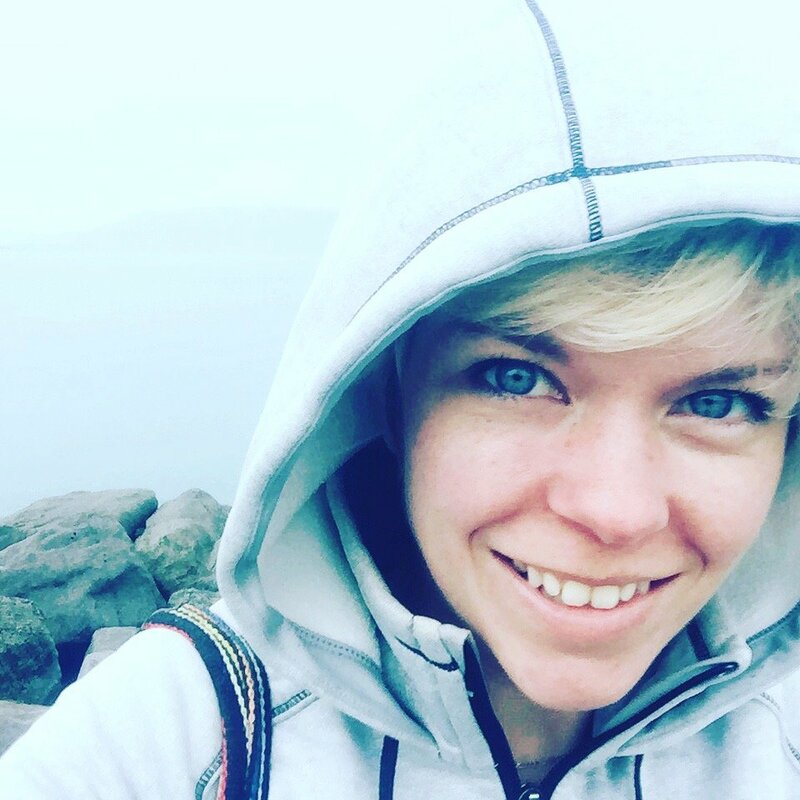 In this particular post, they bring their audience into the world of Indigenous students, showing how their product helps remote areas connect and engage globally. You can adopt this tactic regardless of your industry. All you need to do is create original content from where and who you serve, and develop stories from real-life examples. Where is your product or service made, sold, or used? How can that location demonstrate the effectiveness of what you do? Where are your customers from, and where are your headquarters? What are day-to-day experiences that your employees or customers partake in that your target audience would find appealing or informative? The goal is to hook them with a real narrative that brings your product or service to life. From Pinterest to Tumblr, the internet is full of inspirational quotes. We love them, so why not use them in your content strategy? However, before you start Googling for quotes by Abraham Lincoln or Dolly Parton, go back to your core values. You want to select quotes that demonstrate what your brand stands for, not merely share quotes that are favorites. 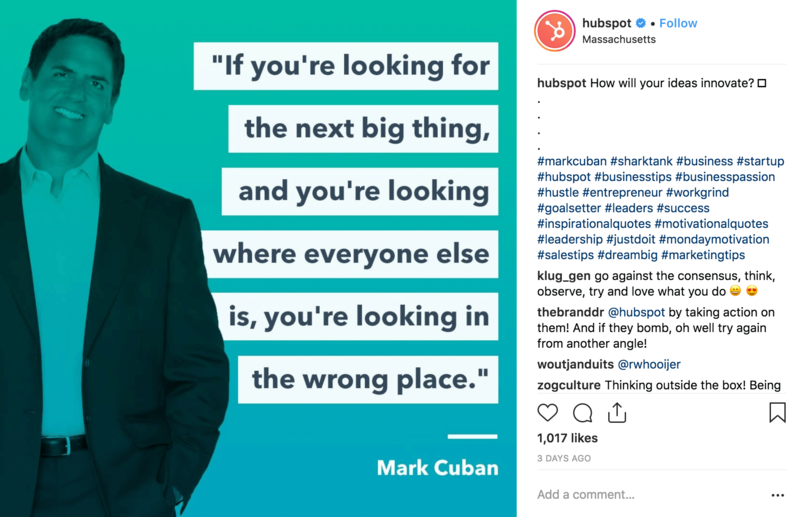 HubSpot is a fantastic example of finding quotes that relate to their brand’s core beliefs. They choose thought leaders and celebrities that foster feelings of trust, reliability, and wholesomeness, which align with their brand very well. You can use your brand strategy document for ideas, or revisit your brand script (we use StoryBrand to build them) or Value Proposition Map for additional clarity about your values. Tools like Canva make it easy to create images quickly and for free, with a wide variety of social graphics templates. The more creative and customer-centric your social media content is, the more successful it will be. And given how time-consuming and costly making assets can be, content is an initiative worth doing well. If you don't innovate now, you'll be amongst the majority of companies that churn out lackluster content, and see weak results. That's why brands like HubSpot, Cisco, and Patagonia continue to grow their social media audiences, allowing them to invest more in the initiatives. If you want to experience the benefits you've heard that social media can bring, it's time to improve your content marketing effectiveness. We use our inbound marketing research and strategy to hit a home run with content for social media, and you can, too. Check out our free eBook,Conquering the Inbound Marketing Mountain to learn how you can shift your entire strategy to attract and land more qualified, valuable customers.